This is a follow up post to my review of the recent Failed Architecture workshop about Bank Street in Sharjah. Over here I will share with you photos I shot on film, a visual essay if you will, and some of my conclusions which I had to write on the last day of the workshop. Before you read my conclusion, however, I'd like to say that my experience with Bank Street really started last year when I visited it several times during the 11th edition of the Sharjah Biennial* to see the exhibitions in one of the buildings on that street and the public installations (The Bank by Superflex and Random Calling Cylinder by Carsten Höller. I was enthralled by the art in the midst of a busy public space in Sharjah, something that isn't done with much success in Dubai or Abu Dhabi. Since then, Sharjah gained my complete admiration and continues to do so. Anyway, here are some of my thoughts from the last day of the workshop that I wrote as a conclusion after working on the "reputation" part of the timeline we created (the timeline is up at Maraya Art Centre till 15th May and open to the public). After that, take a virtual walk with me along Bank Street and the Heritage Area in the Heart of Sharjah. Sharjah instills mixed feelings; common words associated with it include traffic jams, too conservative, cultural. The heart of Sharjah was home for Emiratis up to 1970s. With the construction boom, they moved away from an area associated with hard times, into bigger more comfortable homes. This also paved the way for new tall buildings. The modernist architecture appealed to expats, the “new” heart of Sharjah was a posh address. Despite a shift in demographics and becoming less posh, Bank Street continues to be active. In recent years, Sharjah Art Foundation/Sharjah Biennial/Heritage Days introduced a new wave of visitors due to activities in the surrounding areas and on Bank Street. The plans for the new Heart of Sharjah (2.0?) is going back to becoming a desirable address, by re-defining it and introducing a “new old” heritage architecture based on the original 1950s blue print – to become a tourist/leisure destination. Dismissing the recent history of Bank Street is at the expense of history/memory of a place that has been thriving for the past four decades. There’s a duality of heritage and history on Bank Street. Is there a way to integrate recent history that current population can relate to, with the distant history that only has emotional connections? My favourite block of buildings on Bank Street. The buildings are lined up in pairs along the street. 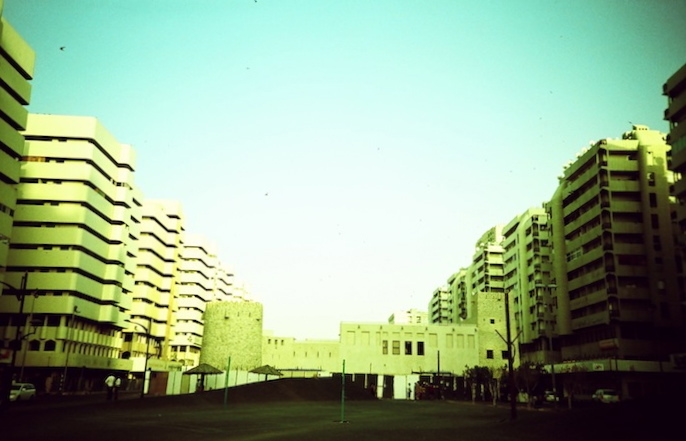 Al Hisn (The Fort) that was reconstructed in the 1990s in the middle of the the two blocks of buildings on Bank Street. The building with the orange banner was one of venues for the 11th Sharjah last year. Al Hisn (Fort), reconstructed heritage blocking one part of the modernist architecture which will eventually be demolished. Advertising on the scaffolding around the fort. "Working Ladies" made me laugh. Another pair of buildings, this one is overlooking the remains of The Bank by Superflex. Benches from The Bank by Superflex. The second block of buildings on Bank Street, also lined up in pairs. An rooftop view of Bank Street. Balcony spaces turned into rooms? In complete contrast to Bank Street, this part of Sharjah is a mixed bag of what I describe as reconstructed heritage and an attempt to restore the few remaining buildings and houses that existed before the 1970s construction (and demolition) boom. One of the few original walls that's under restoration. Protecting the walls and advertising Sharjah Heritage Days Festival. One of the buildings in the Heritage Area that is getting restored, it is dated 1363 HIjri (Islamic) Calendar, around 1943 Gregorian calendar. Another original building that is being restored. This house is called Majlis Al Midfaa and has a unique looking round (and slightly leaning) windtower. Notice the tall tower in the background incorporating the traditional windtower design on the roof, and completely missing the point of the function of a windtower. More restoration taking place in the following buildings. The following photos are of some of the reconstructed buildings mimicking the historical buildings. These look like complete stage sets. Was waiting to see actors in costumes walking by. You can read my review of the Failed Architecture workshop here, and you can read Failed Architecture's report here. * I never got a chance to share with you my review of last year's Sharjah Biennial, which was my number one art event in the UAE last year. I am still planning to share my photos and thoughts from last year, so watch this space. All photos © Hind Mezaina. Shot on Agfa Precisa film with my beloved LC-A+ camera.